Are you using Teleriks TeamPulse agile project management tool and EA? Well, until recently I wasn’t aware of TeamPulse and I am sure there are many more tools out there that I’ve never heard of (and could benefit from!!). It was through a request for help that I became aware of TeamPulse. As a server based system ,TeamPulse provides the features that a project manager needs to manage the full scope of any agile project. The initial requirement from the user was for a means to seed their TeamPulse project with information derived from their initial analysis of a project which they performed in EA. output linked items, so the output of a single item may result in the export of many items – even more information and what’s more, the need to verify all the relationships are handled; this can be a bit of an auditing minefield if done manually!! minimising the risk of making errors in the process. Having produced quite a few EA AddIns the export of information is usually not a problem provided there is a well documented API. And, if there is a requirement to maintain future relationship or awareness of EA elements, a place to store information (usually the EA GUID) in the target tool. With the excellent support received from Telerik I was able to gain access to the relevant information to address these issues, and when there were questions regarding some of the detail very help support. supports additional custom fields to be added to its workitems and we were able to use this to store the GUID of our related EA element. This meant we could match EA elements with TeamPulse items. So with the relevant capabilities in place we have been able to produce an EA AddIn (eaTP) that addresses the basic use case to support the export of information from EA to TeamPulse throughout the life of the project. This means that EA users can continue to do their work in EA, whilst providing the project manager with the information they need to perform their tasks. 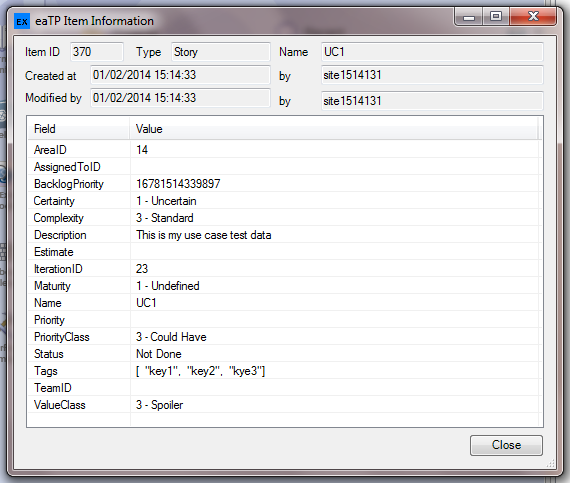 And although the focus of eaTP is very much on exporting the information into TeamPulse, it also provides a means to inspect individual TeamPulse items within EA so the EA user can have a quick look at information that may be relevant to their work. So if you are a TeamPulse user (or looking for a project management system to work alongside EA then perhaps TeamPulse is a tool to review) and using EA you may wish to try eaTP. If why not give eaTP a try and importantly provide us with feedback on its functionality and usefulness. I’m off back to do some more exploring of EA – but just want to point out that there was a really interesting webinar this morning from Sparx on “Creating Charts in Enterprise Architect to Aid Decision Making ” – if you missed this event keep an eye out on the webinar section of Sparx as I’m sure they will make it available soon. This entry was posted in All on 25/09/2014 by exploringea.